Electricity. 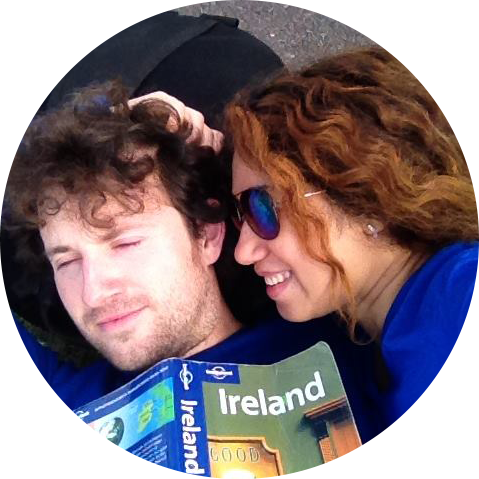 It’s vital for many of you travelling in today's modern world. You need it to keep the fan, aircon or other appliances running in your hotel room and you use it virtually every day to charge your cameras, phones, laptops, iPads and other electronic devices. However, because there is, as yet, no universal plug type or universal voltage standard in the world today, plugging your devices into a wall socket while abroad can often be more of a challenge and potentially more of a hazard to your devices than it should be. As you travel you will encounter a variety of issues with getting your devices plugged into foreign power sockets. 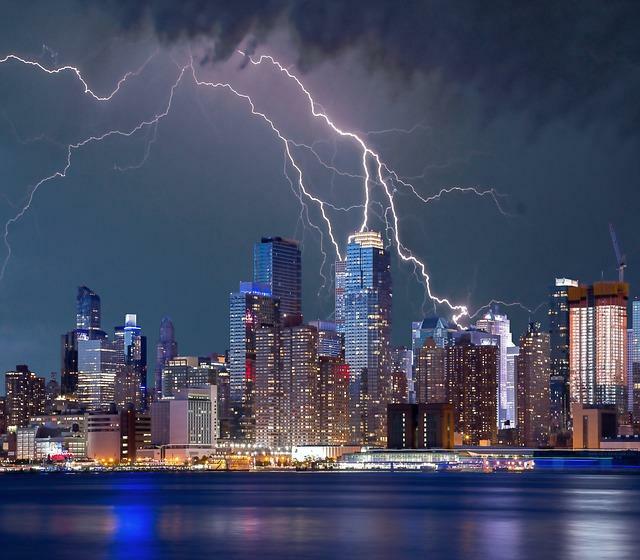 There are also some dangers to be aware of when plugging electrical devices into voltage grids that they were not designed for. There are a handful of issues you’ll face with power outlets while travelling. The most obvious one is that they’ll often be incompatible with your device's plug type. Another common problem is not having access to a sufficient number of power sockets to allow you to charge all of your devices simultaneously. Awkwardly positioned power sockets behind obstructions or high up on the wall can also make it difficult to plug in your devices. Another very common difficulty you might face is trying to plug 2-pin plugs into a 3-pin socket, due to the in-built safety mechanism. Let’s now talk about how to deal with all of these issues. To give a little background information on this topic, there are 15 different plug & socket types in use in the world today. They are each designated a letter from the alphabet and they run all the way through from Type A through to Type O. 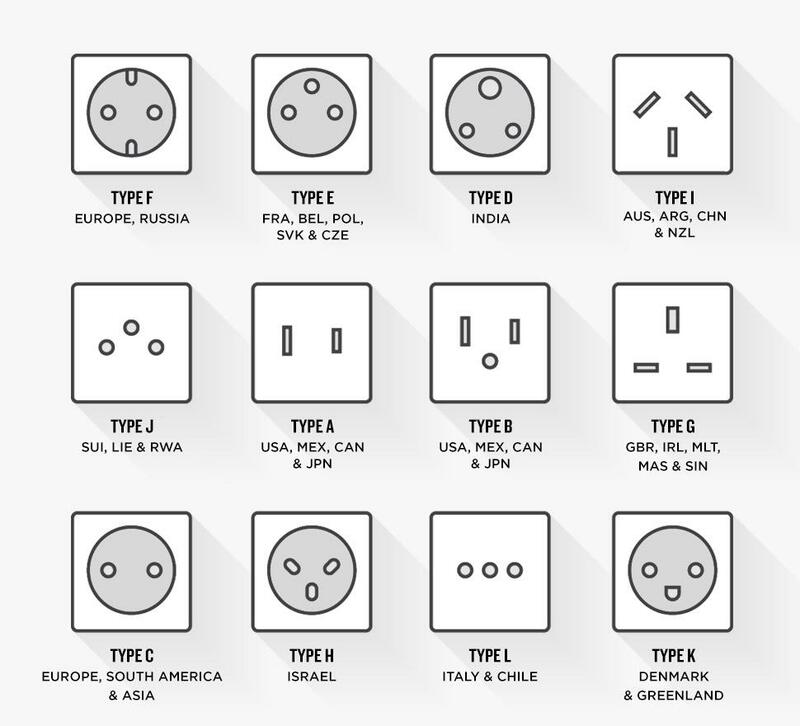 Some of these plug types are exclusive to one country or a handful of countries while others are more widespread and found in multiple countries. To complicate matters further, an individual country may use up to 6 different plug types! 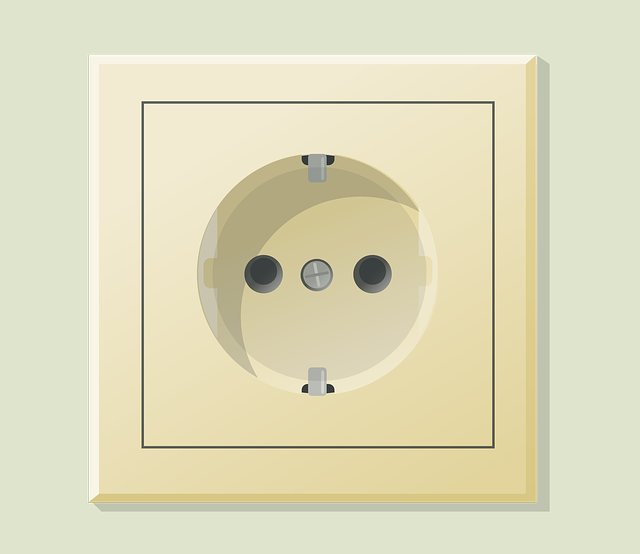 Some plug types use 2 pins (ungrounded) while others use 3 pins (grounded). Some types use flat pins, some use round pins and others use a combination of flat & round pins in the same plug head. 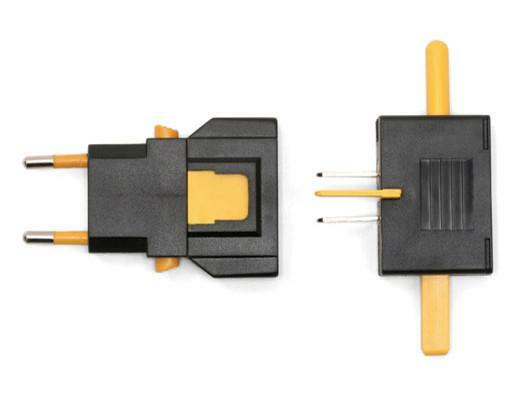 The most commonly used plug types world wide are Type A (two flat prongs) and Type C (two thin round prongs). Power sockets types across the world. 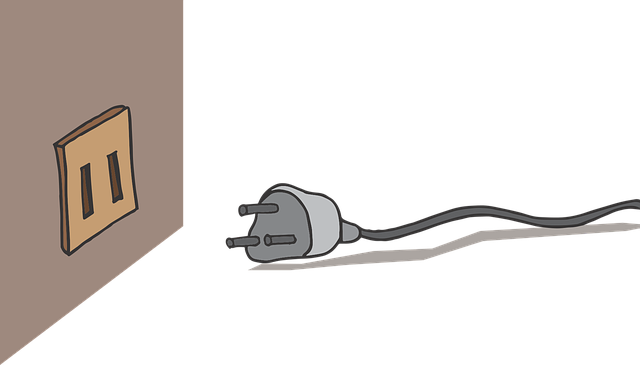 If you have a specific country in mind and you're wondering what plug type(s) that country uses, take a look at this excellent page. Of course, the main problem posed by all these different types of plug socket types will be their incompatibility with the plug type that your devices use. Some travellers solve the problem by picking up a new country-specific adapter in every new country they visit. This type of adapter will usually only accept one plug type and convert it to one other plug type. The problem with this approach is that the newly purchased adapter could quickly become redundant, especially if you’re the type of traveller that moves very fast, since even neighbouring countries can often use completely different socket types. This country-specific approach also seems wasteful. Having to keep buying and throwing away adapters that only work for 2 or 3 countries isn’t exactly economical. Even if you don’t throw the old adapters away, you end up carrying extra adapters you don’t need and that’s not ideal either. Some hotels can provide you with an adapter but they may not always have one that accepts your plug type and you may not always be staying in a hotel or guesthouse that does. Hardly an ideal solution either. So what’s the best solution? We have found through trial and error that the best solution is to carry a device called a universal travel adapter. These will accept nearly any type of plug and you can also plug them into nearly any type of socket. Most of them will work in over 150 countries throughout the world. With that in mind and with literally thousands of models to choose from, it can be a headache to try to figure out which one to buy. We've done a lot of research to source the best of the bunch for you guys. 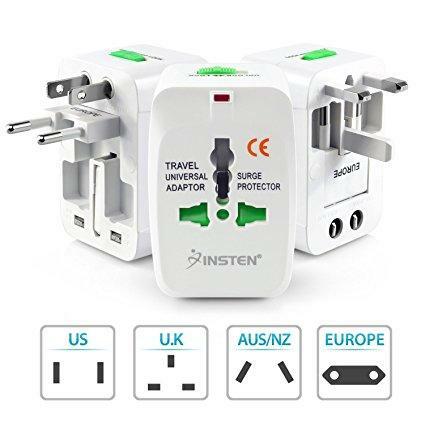 This is excellent all-round travel adapter, which has been receiving great reviews on Amazon. The dual USB ports are a really useful feature that many other travel adapters don't have. 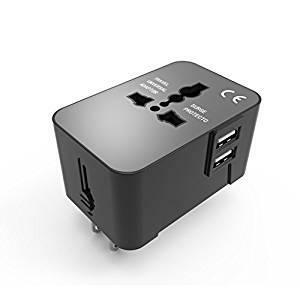 This is another very popular travel adapter with plenty of excellent reviews on amazon. If you don't need the dual USB ports and you're looking for a budget option, this one will be difficult to beat. If you're looking for an ultra-compact and lightweight travel adapter with interchangeable parts, this one is pretty ingenious. Some of you will appreciate the way it folds flatter than most other travel adapters. The reviews on Amazon have been very positive. Often, one power socket is simply not enough. When you’re travelling, it can often be difficult to find a single working power socket, let alone several. Buses and trains don’t always have them and the charging stations in airports can be highly competitive places, with everybody vying for a limited number of power sockets. While almost every room you stay in while travelling will provide you with at least one power socket, sometimes that’s all you get and one measly power socket isn’t enough for people with 2 or 3 devices. It’s frustrating not to be able to charge all your devices simultaneously, not to mention time-consuming. Similarly, if you travel with a friend, partner or in a group and you all share a private room together, you’re all going to have to compete for that solitary plug socket just to charge up one device. Free power sockets can also be in short supply in hostel dormitories, where the ratio of people: power sockets can get very high indeed. So what to do about this problem? Well, a device called an outlet-expander can create multiple power outlets for all your devices and friends but you have to choose the right one, as many of these are way too large & bulky to be a practical thing for a traveller to carry. We’ve often been able to pick up really cheap, country-specific mini outlet expanders in electrical shops while on the road. These are awesome because they’re so small and lightweight and can give you 2 or 3 extra outlets. However, these will only work for you if the plug your device(s) uses is compatible with the socket type(s) of the outlet expander! 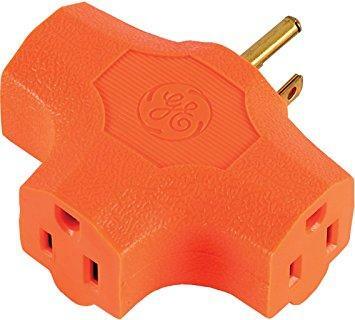 For example, if you buy a mini outlet expander in India, it’ll only accept the Indian plug type or other similar round-pin plug types so bear that in mind. This outlet expander we picked up in India allows us to charge 3 devices at the same time using a single power socket. However, it only accepts devices with round-pin plugs. If you're not on the road yet, you can still easily pick up a decent portable outlet expander designed for travel before you leave - and make sure it's one that all your devices will plug into. Another solution is to pick up a portable power strip, again making sure it has plug sockets that are compatible with all your devices. A power strip is just like an outlet expander, but the power outlets are arranged linearly, along a flat strip. As with outlet expanders, you have to be careful choosing one of these or you'll end up with something way too heavy and bulky for travelling with. You can buy power strips and outlet expanders just about anywhere, but most of them are way too bulky and heavy to be practical for travelling with. We did the research for you guys and came up with the best ones for travelling with. This power strip from Tripp Lite has received a lot of very positive reviews on Amazon. It comes with 2 USB ports and 3 outlets. For international use, it should be plugged into a voltage converter, as it can't handle 220V on its own. 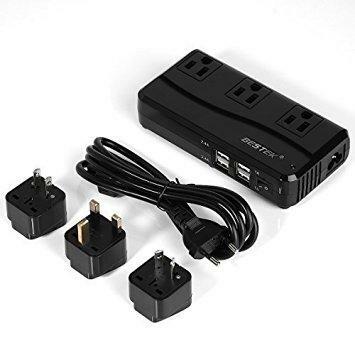 This highly portable power strip has technically been discontinued but a quick search on google will turn up a number of outlets where it can still be purchased. 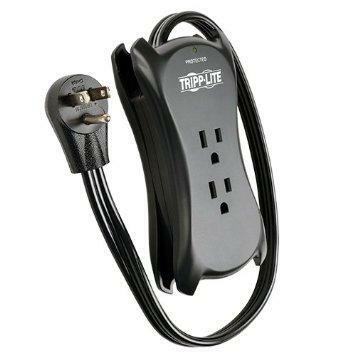 It's a little more compact than the Tripp Lite but lacks the surge protection. 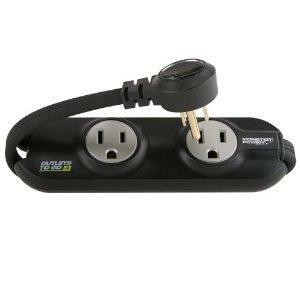 This outlet expander is a great budget option for travellers. It's a super simple design without any of the fancy extras but it is extremely rugged and durable. 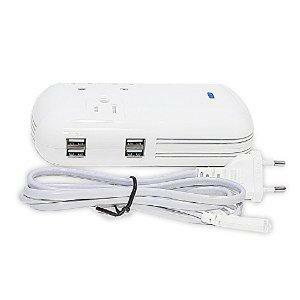 There's no surge protector but it does exactly what you need it to do; convert one outlet into three. The reviews for this product are solid and for under $5 on Amazon, it's a steal. Just plug the power strip or outlet expander into your universal travel adapter and then plug the travel adapter into the power socket on the wall. Now you have a solution for charging 3-4 devices simultaneously in virtually any country, even if the room only provides you with a single power socket. You probably know the ones we’re talking about. Plug sockets that are positioned really high up on the wall, behind an obstruction or just really far away from the nearest flat surface where you can set your device down. The reason they're a problem is that either the charging cable for your device ends up being too short to reach the power socket or the obstruction makes it really difficult or impossible to actually insert the plug into the socket. This is particularly an issue if there’s no alternative socket in the room and your only choice is to use one of these senselessly positioned sockets. In most cases with awkwardly or badly positioned power sockets, the best way to get around the problem is to have longer charging cables for your devices. Get extra long USB cables for your smartphone and if you have an extension cord for your laptop charger, bring that too, even if it is a little bulky to carry. You’ll be thankful for the extra length. As for obstructions, heavy furniture can usually be moved away from the power socket with a little effort. Newbie travellers are often spotted in a struggle to force 2-pin plugs into 3-pin sockets. The plug pins are the correct shape for the socket so they can’t figure out why they won’t go in. First flip the socket switch to the off position so you can’t get electrocuted. Now, take a pen, pencil or other narrow, pointy non-metallic object that doesn’t conduct electricity very well (just as an extra precaution) and push it into the upper earth pin hole, pushing the lever inwards and downwards slightly. This should release the safety lock and while still holding the safety lock open, insert the 2-pin plug of your device fully into the two remaining pin holes until it’s properly connected and voila, problem solved. This is a little used hack and not really recommended unless it's an emergency. In Malaysia we often had success in plugging round 2-pin Type C plugs into the 3-pin rectangular Type G sockets they use over there. Type G is the same socket type used in Ireland, Great Britain and a few other countries. There's no real trick involved here; the technique just requires a little bit of force and persuasion but it does work with some Type G sockets. So yes, it’s possible to fit a round peg into a square (well, rectangular) hole. We’re not sure about fitting a square peg into a round hole though. Another issue that travellers might be confronted with is that of changing voltages while travelling. 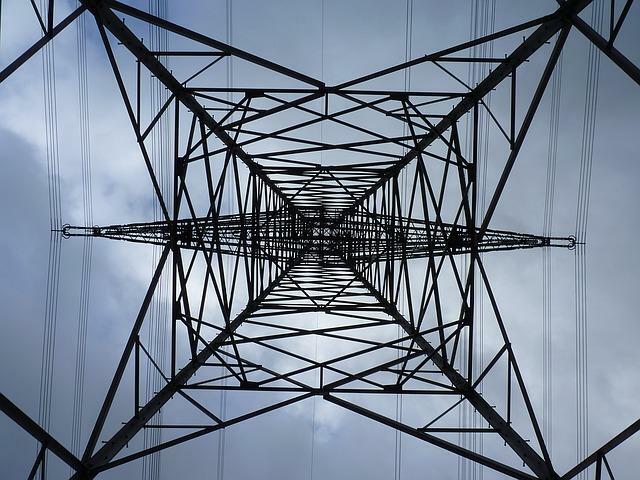 There are two voltage standards used in the world today. By far, the most common voltage standard is the 220-240V AC (alternating current) standard. Countries that use this voltage standard far outnumber countries that use the 100-127V AC standard. However, the USA, Canada & Mexico all use the lower (100-127V) voltage standard. It’s also the dominant standard in Central America and in the northern part of South America. It’s used in Asia by Taiwan and Japan, in the middle East by Saudi Arabia and a select few African countries use it too. Some countries use both voltage standards within the same country. For a full and detailed breakdown of the voltage standards used by all the different countries in the world see this page. 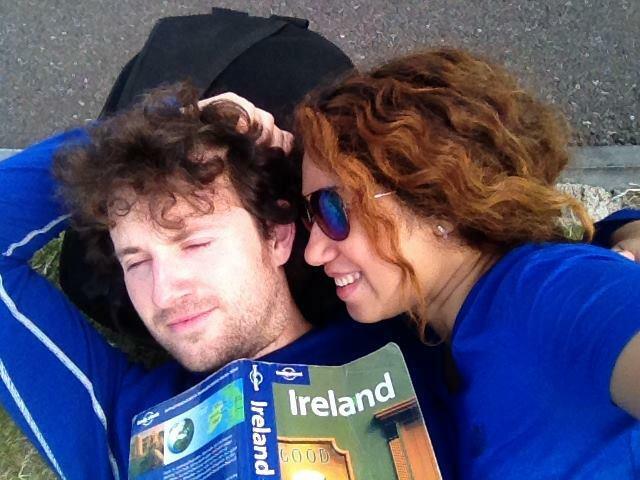 So, on a practical level how does all this affect you as a traveller? Well, the only time you really have to worry about voltages is if you’re travelling with electrical devices. Electrical devices are things like blenders, hair dryers, hair straighteners, curling irons and immersion rods (usually convert electric energy to heat, light, motion or sound). They don’t normally have a computer chip and they operate on high voltages and use a lot of power. 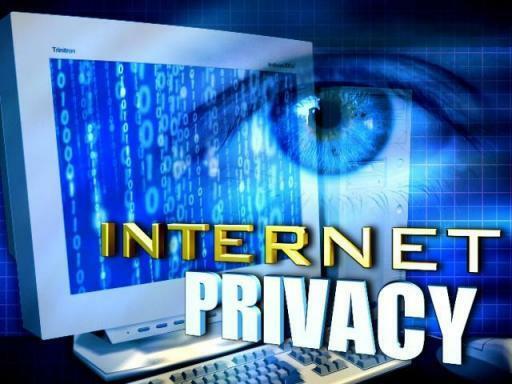 Electronic devices are things like your smartphone, laptop, MP3 player, iPad, Kindle Reader etc. These are more sophisticated devices which do have a computer chip and they operate on much lower voltages and consume less power. Most electrical devices don’t have an in-built voltage converter so if an electrical device is designed to run on 120V and you plug it into a 220V mains supply, you’ll probably witness a spectacular fireworks display and ruin the device. Going the other way, electrical devices designed to run on 220V will work very poorly or sub-optimally if they’re connected to a 110V supply. Electronic devices usually incorporate a transformer into the charging device. For example, iPhones and Mac laptops have the charging block, which converts inappropriate voltages into the correct ones. This means you don’t need to worry about frying your electronic devices as you travel the world, regardless of the voltage supply. If you want to travel with an electrical device or an electronic device that doesn’t incorporate its own voltage converter, you’ll have to buy an external voltage converter to ensure its survival. There are a few factors to consider when choosing a voltage converter for travel. It should obviously be compact and lightweight for portability. Unfortunately, many voltage converters fail miserably in this department. You need to also figure out the wattage of your most power-hungry device that needs voltage conversion. The voltage transformer that you purchase should be able to handle at least twice and preferably three times the wattage of your most power-hungry device. 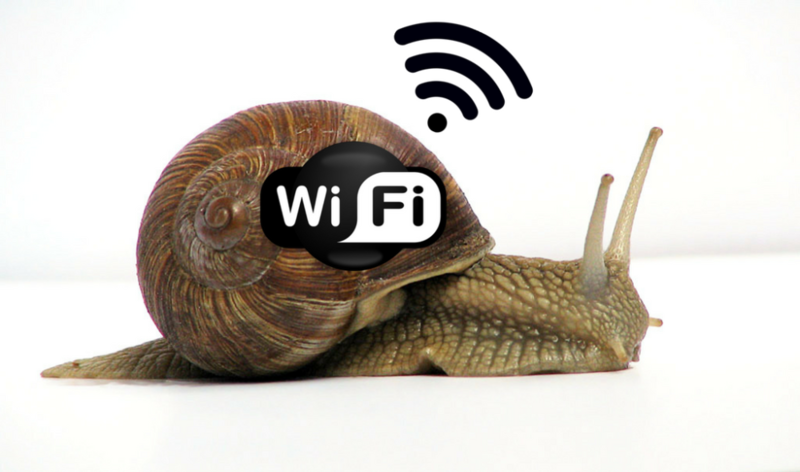 This is because it needs to be able to handle the initial surge of power when the device is first switched on. We've found two voltage converters that we really like for travel. These fit the bill in terms of functionality while still retaining that all-important portability. This is one of the most portable step-down voltage converters out there, so it's perfect for travel. It converts higher foreign voltages up to 250V down to 110V or 120V, making it safe to use with US devices. Reviews on Amazon are mostly excellent with an average rating of 4.5/5 stars. This step-down converter is one of the lightest ones around. It converts higher foreign voltages up to 265V into the 110V US voltage, protecting your devices from inappropriate voltages. Using a voltage converter: To use a voltage converter, it's just like using a travel adapter. You just plug your device into the converter and then plug the converter into the wall socket. Alright, that's it for this article folks. We hope you've found some of the tips and products we've shared helpful. If you have any questions or concerns, leave us a comment below and we'll endeavour to reply to you as soon as possible.